From the early through the late Middle Ages, Europeans moved from a disorganized, almost mystical way of thinking about the universe to an acceptance of a well-ordered, geocentric universe based upon the ideas of Greek philosophers such as Ptolemy and Aristotle. 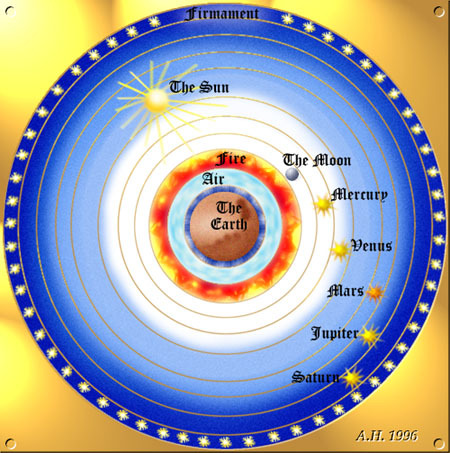 In this universe, the Earth was at the center and other heavenly bodies rotated around it in a series of concentric spheres (see the diagram to the left). The entire system was powered by the primum mobile, or "Prime Mover," which was the outermost sphere set in motion directly by God. It took some very creative thinking to make this universe work well. For example, the retrograde motion of the planets in which they sometimes seemed to be changing directions and moving backwards was explained by way of "epicycles" (see the diagram on the right below). Specifically, it was proposed that the planets rotated around a center point fixed in place on the sphere of that planet, causing the apparent change in the direction of planetary motion. Since medieval Europeans had no conception of a vacuum, it was believed that the heavens were filled with a celestial fluid that flowed as the spheres of the universe rotated, thus sustaining the motion of the planets. Furthermore, all of this motion created a beautiful "music of the spheres" which could not be detected by humans (at least not until after they died and went to heaven), but which provided pleasure for angels and other supernatural beings. The gradual change in European thinking about the nature of the universe was accomplished by way of contact with the Islamic World, where scholars such as Ibn Sina (Avicenna) and Ibn Rushd (Averroes) had preserved much from ancient Greece that had been lost to Western Europe. It was primarily through the work of Christian scholars such as St. Thomas Aquinas that these ancient Greek views about the nature of the universe became welded to Christian Theology in a way that would cause great problems for scientists such as Galileo a few centuries later. Dante, in his "Divine Comedy," put the finishing touches on this Medieval Universe by providing such detailed descriptions of it (including maps of hell, purgatory, and heaven!) that people knew that things just had to be as Dante had described them. Just as the physical universe was thought to be centered around the Earth, the psychological universe of Medieval Europeans revolved around humans. Any understanding of the psychology and behavior of individuals at that time requires a consideration of the person's desire for eternal salvation. [Not to be confused with the "eternal salivation" once written about in a paper by one of my students . . . ] For Medieval European Christians, time had essentially two divisions: The brief and insignificant one in which they lived out their sinful lives, and the cosmically enduring one in which the suffering or joy of their souls would occur. In Medieval Europe, there was no room for abnormality or nonconformity, as ANY deviation was considered to be the work of the devil. A hierarchy was everywhere in all things. People accepted their place in the social order no matter how lowly it might have been, and everything in the world had the potential for symbolizing something supernatural. People perceived messages from God in virtually every natural and human event. A good insight into this worldview can be acquired by reading some of the works of The Venerable Bede, especially his "History of the English Church and People." How this worldview affected the lives of the people of the time, and how its influence can still be felt by those of us living in the 21st century makes an intriguing story. Check out some of the links listed below for more information on medieval worldviews and related topics.